Roo, our nearly 14 year-old Sheltie, passed away recently. Roo’s life was nearly indivisible from the life of the business: day in and day out, he watched as clients, staff, and editors collaborated on the table and via the computers far above his head. Although we must admit that he would sometimes inhibit efficiency by positioning himself behind office chairs or charging through perfectly balanced laptop cords, he spent most of the time providing friendly pants to sooth frenzied passersby. We will all miss him dearly. Below, a reflection on his life and being by one of his direct owners, the son of Dr. Weiner. I’ve often observed that when a pet dies, friends and family reach out and extend their condolences to its owners, as if the pet itself had no worth or impact on the world, but was merely a furry accessory to its two-legged superiors. How hard it must be for the people to endure such a loss… with no mention of the loss of the animal itself. When Roo died, while much of this typical consolation poured in, a significant amount of the emails and phone calls we received did not follow the usual script. Many people who had known Roo felt personally touched by his kind and graceful presence. They commented on his character, his effect, shared memories they had of him, and in essence joined our immediate family in the grieving process. Instead of leaping to validate our pain from an external place, the people in our community who had met Roo were forced to look within themselves and reckon with their own feelings of loss. Not to imply that dogs are inherently incapable of deep and sincere emotion, but Roo had an extraordinary, almost human capacity to connect with each person he met. He was infallibly sweet and good, undisturbed by hardship, cynicism, or hatred; only moved by the occasional bout of early morning elation or the smell of something particularly luscious wafting from the kitchen. It was this familiar and warm disposition that made Roo such a loving force in so many of our lives. I personally feel that I not only benefited from his loving presence, but that I also learned from him. Roo was my dog, but he was also my teacher, and as we grew up together I gained so much from watching the way he carried himself through life. Roo taught me love in the way he faithfully slept by my mother’s side, willing to be manipulated at any given hour of the night; shifted, twisted, prodded into a position more conducive to sleep for the both of them. Roo taught me compassion in the way he would lie on top of me, silent and unwavering, soaking up all of my tears with his great mop of hair… a warm, swelling sponge of empathy on the in-breath, and a woosh of unconditional love against my ear on the out-breath. Roo taught me how to heal in the way he used himself to glue mom and I together after an argument, meandering over with a look of confusion that made you question why you were up in arms at someone you loved, or offering a nonpartisan nuzzle that brought together both parties in peace and affection. Roo taught me how to love life in the way he ferociously gobbled down all things edible (and even those not: there was many a truffle consumed when we weren’t paying attention, but despite our frantic Google searching and emergency vet dialing, he never had a problem—his stomach quickly became known as ironclad), and in the way he joyfully hopped along the monotonous route to the same local park every morning, and in the conviction with which he rested blissfully, for the majority of the day, under the living room table. He lay there on his side with such purpose, orbited by our feet as we strode back and forth, like a sort of dazed sentinel keeping a sleepy but solicitous watch of household affairs. Lastly, Roo taught me how to be vulnerable in the way he let himself gradually relax into a heavy state of cozy slumber as the evening drew to a close. By the time we were ready to carry him up to bed, he would have seemingly doubled in weight and temperature, semi-sedated and totally trusting of us as we lifted him from his beloved living room rug. We would haul our dog-by-day, furnace-by-night up the steep ascent to our bedrooms on the second floor and he would flop onto the mattress, proceeding to radiate unadulterated warmth for the rest of the family to enjoy. 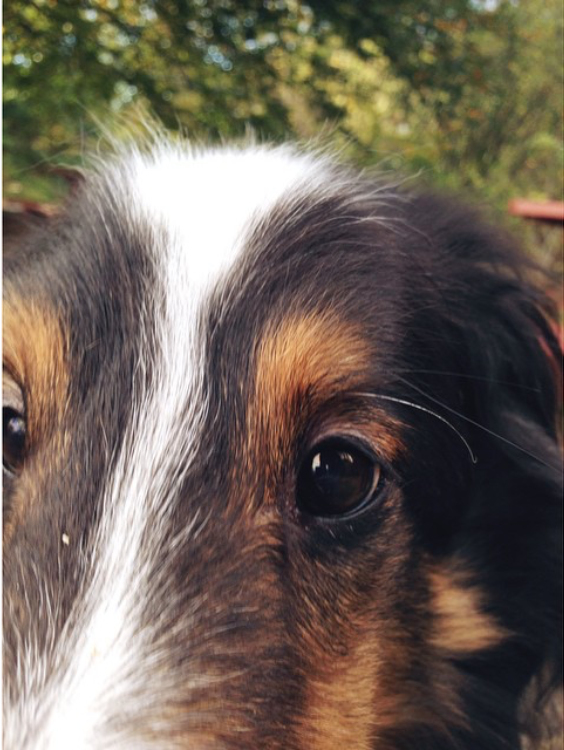 This was Roo; the tri-colored Sheltie who spread love wherever he lay (and the occasional places he walked, too). Some might cite his appearance—a mix between canine androgyny (his gorgeous coat often couldn’t be correctly placed by fellow park goers, and over the years he learned to respond to both “good boy” and “good girl”) and a look of sage wizard wisdom that came from his wild mane, graying whiskers, arched brow, and the permanent twinkle in his eyes. I, however, would argue that Roo was far more than just fluff with eye appeal. To the people who truly got to spend time with him, Roo displayed an undeniable power, love, and humanity that will stay with us long after our memories of his handsome appearance fade away. He was a special dog, and we will always love him. We will always love you, Roo. This entry was posted in Uncategorized and tagged dog, pet, reflection by editors. Bookmark the permalink.